We're moving very slowly and silently up the hill from the Skyros Centre. It's late afternoon and the last day of the art/landscape workshop. This is a quiet climax. I know where we're heading, but the others don't. Is it possible to experience this amazing physical and historical environment differently, even when I think I know it so well? Murray and David are exploring the architecture, as we ascend, and how it changes. Claire is looking for beauty. Lynn is noting down every sound she hears. Her list is getting longer by the minute. We are all helping each other, pointing out views, clusters of bougainvillea, historical details above doorways, the sound of a family chatting. We communicate freely but never speak. People pass us, noticing our silence, our stillness or how we are intently gazing in different directions. We are a tribe of acute awareness. When we reach our destination, the terrace of the Faltaits Museum, we slowly and gradually begin to speak again. I have never before experienced Skyros Town as a communal design project. For the first time I realise that the residents of individual houses consider the viewpoints of their neighbours' properties, to make the most of every view, every corner. This is a collective artwork in progress. And Murray mentions that the architect Le Corbusier was influenced by Skyros. The light is fading now on the terrace as we chat, draw, make notes and enjoy the mountain tea and coffee served by Manos, who'd answered our questions about Skyros a few evenings before. He apologises for the amount of tea served. I apologise for the number of coffees ordered. The museum is as intriguing as ever, inhabiting its own architectural triumph. How fortunate are we? Speechless again. Richard Layzell facilitated his course in Outdoor Art at the Skyros Centre in Greece this summer. Richard is an award-winning artist, writer and teacher. His current exhibition, The Manifestation, (with Tania Koswycz) is touring the UK, and their dialogues, Cream Pages, is due to be published this year. 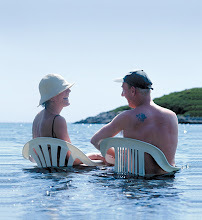 Find out more about Skyros holidays at www.skyros.com. Richard teaches at both the Skyros Centre in the village and at the Atsitsa Bay Centre.